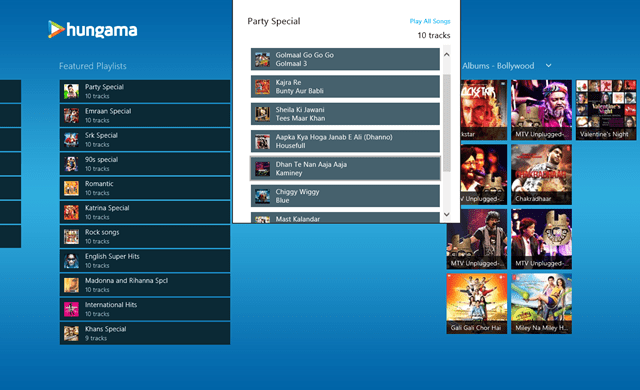 Hungama MyPlay is a free Windows 8 Songs App that lets you play songs online. This songs app for Windows 8 just needs your Internet permission and it will provide you a wide variety of songs according to your mood. Yes, it will arrange your favorite songs according to your mood like if you want to listen to romantic tracks, just click on the romantic emoticon and hit the Record. It will show you all the popular online songs of your choice. The Record is enabled with a timeline, from where you can select the period or you can say the range of year, you want to categorize your song list. Just drag the timeline bar and you can skip those old online songs and can listen to your new, favorite, and refreshing romantic music of all time. I especially like the interface of this jukebox. 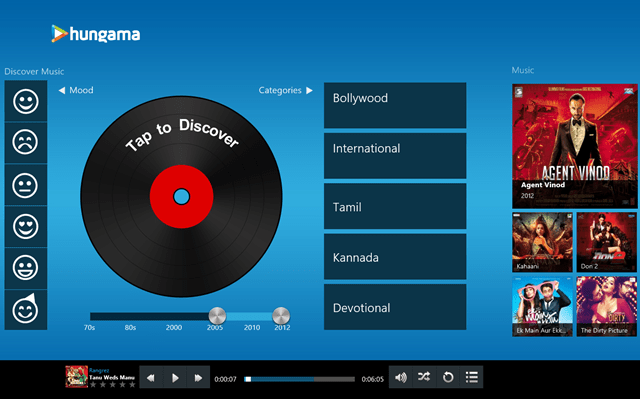 This is how the interface of Hungama MyPlay looks like. And trust me, Hungama MyPlay really got a long list of music with categories like featured playlist, top Bollywood songs and top Bollywood albums. You can also to listen your favorite online songs in Tamil and Kannada languages. Just select the mood in which you are and Tab the Record and the top online songs will be there. You can also listen to top international songs with your upcoming artist and genres. Just select the International Category and you are good to go. This is really a cool way to listen to your favorite online songs without getting confused what to listen. Select your favorite playlist from Hungama MyPlay with the grooviest music which will make your feet go tapping. Play your top party anthem songs with the help of this Windows 8 app and put some air in your party bash. 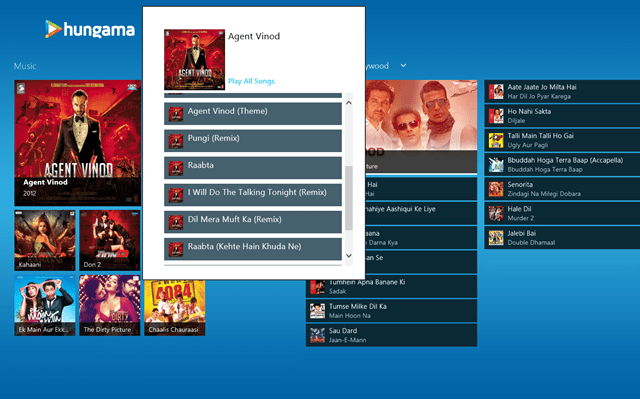 Try this Windows 8 songs app and listen to the top upcoming songs of the era. You will definitely appreciate this cool and funky app for Windows 8 available under the “Music & Video” category of Windows 8, else you can also search it by just entering the name. Check out our post on how to search app in Windows 8 store.